Nova's Sew Straight Guide is SO much better than a 1/4" foot!!!! Nova's Sew Straight Guide is fully adjustable for a huge variety of seam allowances. You decide where your perfect "1/4 inch" seam allowance is! Two unobtrusive screws hold it securely in place so it can not twist and scratch your beloved machine. This is a great guide for sewing and quilting. It allows you to adjust for various weights of fabric so you can achieve the perfect seam allowance. The two screws have minimal sized heads, so they don't catch on your threads and fabrics or bruise your knuckles! The true beauty of the two screws is that they will not allow the guide to twist and scratch the finish on your machine! You can chain piece all day long knowing that all you have to do is bump up against this guide and go! For half square triangles, some flying geese techniques, and bindings, you will still need a 1/4" foot. Nova 'finger tightens' the two screws, but if you prefer to use an allen wrench, she sells those individually for this purpose - just make certain not to over tighten! See below for a video demo and for recommended products. 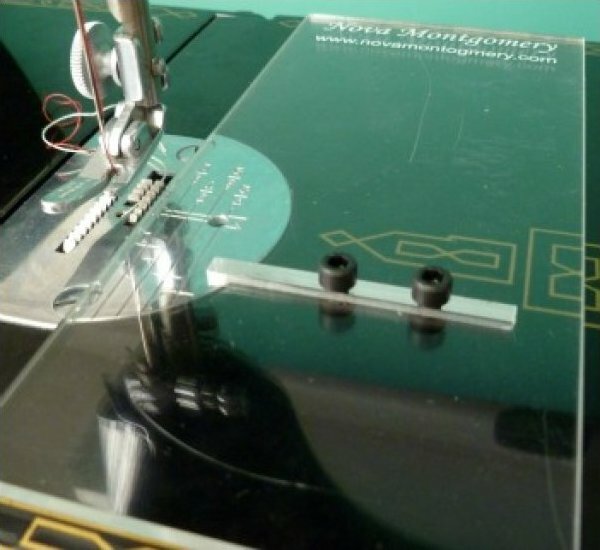 Occasionally there is a problem with the front hole on the needle plate of a featherweight being not countersunk quite deep enough for the screw to be flush (this is especially true of reproduction needle plates). When this happens, the guide sits up too high on top of the screw instead of flat on the machine. The simple solution is to remove the front screw. The rear screw will make certain the needle plate does not move. "I am a 45 year veteran to sewing. I recently purchased from you the Nova Seam Guide, and I LOVE IT!!!" Cora R.
"Just wanted you to know that that I ordered the acrylic seam guide and the screws fit perfectly on my Bernina 550QE. I love it!! Thanks so much for offering it to us. Now I can have a perfect 1/4inch seam (well, as perfect as I can get), on both my Featherweight and Bernina." -- Pat V.
"Oh my goodness this is the best thing since sliced bread. I received mine yesterday and borrowed an allen wrench from hubby and I was off and sewing. I sewed and sewed and didn't veer off the bottom of my piecing. I love it so much I ordered one for my Bel Air machine." -- Sue W.
"I love the Sew Straight Guide. Works great!! " -- Mary Z. "Went to sew with my quilt friends today and got to use the new seam guide I got from your web site. I have to say it works like a dream (and a few of the gals there will be ordering their own!!) Thank you Nova, for a great product and such fast delivery!" -- Florence McM. I just wanted to Thank you for supplying the Sew Straight Guide. I love it. "Received my order today....really fast service! WOW!!! Everything in great condition . Love the Sewing Guide!!!! ......."
I got the new guide and having been using it for strips and pieces. I started a new quilt, Circle Dance, that sews the drunkard's path type of pieces. Usually, I have to put the Curvemaster foot on to sew curves without pinning. It works, but it gets a lot of lint and fuzz on it and is a bit clunky. However, I tried using your guide and my regular 301 foot and was able to sew multiple blocks with the same method (holding the top piece up, bottom L piece flat, tweezers at the end) accurately and completely. The regular 301 foot is slim and unobtrusive. With your guide, I could sew no pin curves very well so color me SEW HAPPY!